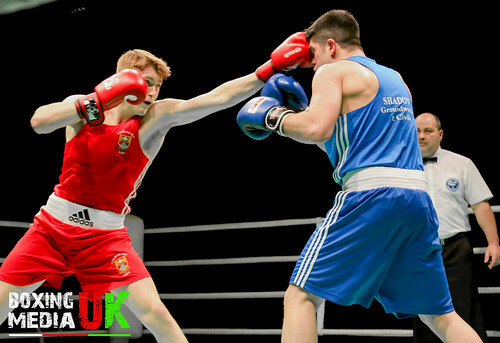 All bouts from the Welsh Amateur Boxing Elite Finals 2018 at Sport Wales National Centre. This is a recording from the live streaming. A fantastic looking Sports Wales National Centre in Cardiff hosted the 2018 Welsh Elite Championship finals. Despite coinciding with the Commonwealth Games in Australia, we still had an extremely strong card of nine contests to enjoy. 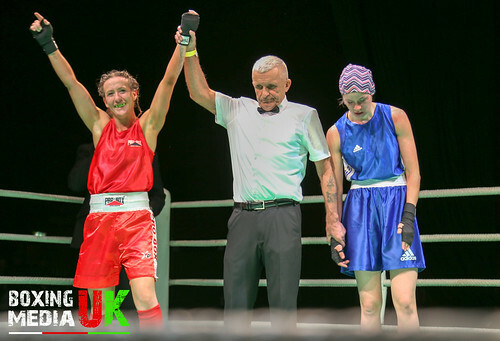 First to enter the ring was female 64 kg finalist Jade Gitsham of Afan Spartans. Her opponent representing Cwmavon Rachel Banks would be fighting out of the blue corner. Gitsham started quickly on the front foot and immediately began to look for a big overhand right. Banks chin was rather high so it seemed just a matter of time before one of these shots would land , sure enough midway through the round Referee Mr Tony Collins issued the first eight count of the evening as Banks was deposited on the canvas. Banks bravely rose but ended a tough opening session by feeling the wrath of Mr Collins for numerous infringements. The second round continued in a similar pattern as Gitsham scored with more overhand rights and straight punch combinations. Banks did land her best punch of the fight, but her right hand did little to deter Gitsham from again snapping the Cwmavon ladies head back. Banks would need a huge final session, it was not to be however after another strong combination forced Mr collins into another count and to then declare the bout over. 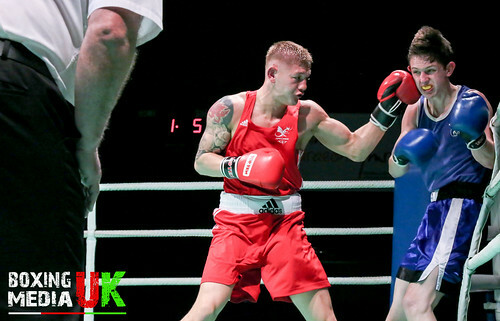 The 2018 60kg Lightweight title was to be contested between Nathan Andrews(Briton Ferry) and Joel Clark (Torfaen). Andrews would have significant advantages in height and reach and it appeared Clarks best chance of victory would be to get in close and turn the contest into a fight at close quarters. Andrews wisely used excellent technique and ring craft to control ring centre and to use his range to great effective. Clark who was using plenty of tactics that weren’t to be found in the Marquis of Queensbury rulebook was not without success of his own. Clarks overhand right found its target but it was Andrews who claimed the opening round with an excellently timed left hook. Clark quickened up his feet but was met on his way in with effective counter punching. The Torfaen lightweight could certainly take a shot though as very few of Andrews punches seemed to effect him. However, Andrews excellent boxing skills seemed to give him the edge as Clarks Forrays into range became less frequent . Clark had clearly been told to give everything he had in the final round as he charged into his opponent. 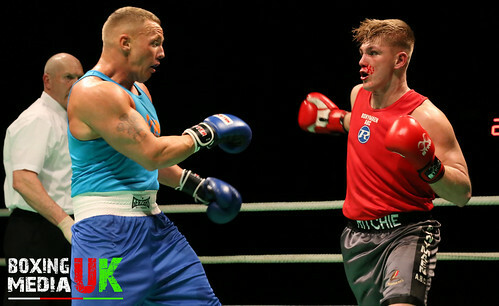 Andrews showed his experience as an amateur to evade his advancing opponent and land counter punches as he came in. Clark was enjoying the occasion as he often grinned after being tagged, yet he finally upset the official too many times and received not one but two public warnings for fouls using the head. Clark fought till the end but it was Andrews who claimed the unanimous points win and championship. second round finely balanced and seemingly depending on which style of boxing the judges preferred. Both corners urged their fighters to win the 3rd and seemingly decisive round. Horrocks was letting his hands go more now and seemed to be having the final say in the exchanges. Pearson scored with well timed hooks but Horrocks cleaner straighter shots seemed to win him the final round. No one quite knew which fighter had done enough at the end . The judges were eventually split in favour of Horrocks in the Blue corner who had impressively upped his game to come on late. Pearson was upset with the decision but did himself and his club proud. 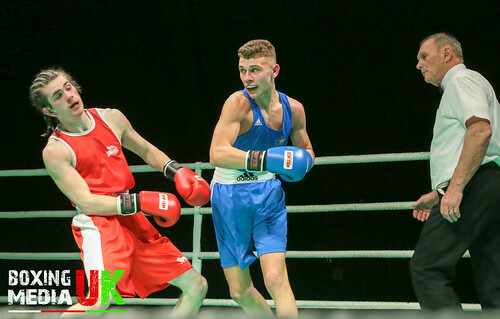 A contest this writer was certainly looking forward to was the final at 69kg Welterweight between Jake Tinklin (Pantside) and Sion Yaxley (Duffryn). Tinklin has learnt his trade the hard way taking on all comers and more often then not earning fight of the night plaudits. In Yaxley however, Tinklin was facing a competitor who has experience at the highest levels and had boxed quite sublimely through the earlier rounds. Bouts between two top operators usually begin with a jabbing contest and that was certainly the case in round one . There was very little to separate the two men in the opener, both jabs snapped out and were more often then not parried or evaded with excellent footwork. The slower Pace seemed to be suiting Yaxley who began to find his range and despite being caught by an uppercut,the Duffryn fighter seemed to be slightly in front going into the third. Coach Turley urged Tinklin to get closer and to let his hands go but Yaxley used this to his advantage as heavy left hooks caught Tinklin coming in. The toughness and heart of the Pantside boxer has never been in doubt. Tinklin bravely fought till the end but ultimately it was Yaxley’s class and experience that made the difference. Superb performance throughout the tournament from Yaxley, Tinklin will no doubt be more determined in defeat and will be back on the circuit in the very near future. 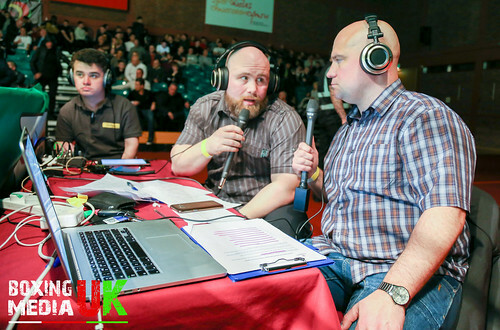 There was a sizeable buzz surrounding the final at 75KG Middleweight and for very good reason. Plenty of fans had travelled to support Joe Smith(Caerau Ely) and Jamie Evans (Dowlais) and the atmosphere in the national centre was about to hit fever pitch. Both men looked incredibly relaxed indeed, Evans held the edge in experience having won the middleweight crown in 2013,2014 and 2015, yet Smith carries no fear and big things are expected of him in the sport . Evans is known as a puncher ,yet sometimes his boxing ability goes unnoticed. The Dowlais man began on the back foot with Smith coming forward. Both men were showing they were boxing at an extremely high level as very few mistakes were made in the opening round. Both landed their right hand ,yet it was really a round that could have gone either way depending on what the judges preferred. Smith with his father John in the corner, was very much rising to the occasion in his very first Welsh Senior final. He came forward well with straight punches yet Evans’s elusiveness began to be a telling factor. A big ovation greeted both of the fighters as the third and final round began. Smith landed his best punch of the fight as a right hand connected with Evans jaw The Dowlais man was really showing how good of a fighter he is though as he took Smiths punches well and replied with frequent counters. The fight reached its conclusion ,yet many felt they could have watched such a display of skill all night long. 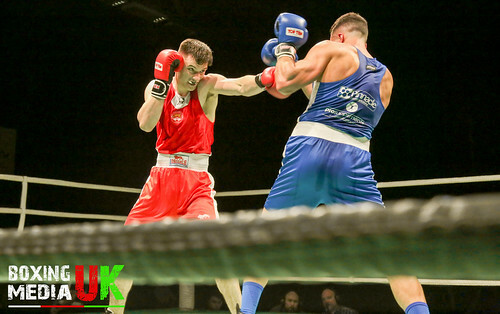 Jamie Evans added the 2018 Middleweight championship to his already considerable collection of accolades while Smiths stock will have seriously risen despite being defeated. It can only be onwards and upwards for such a talent. 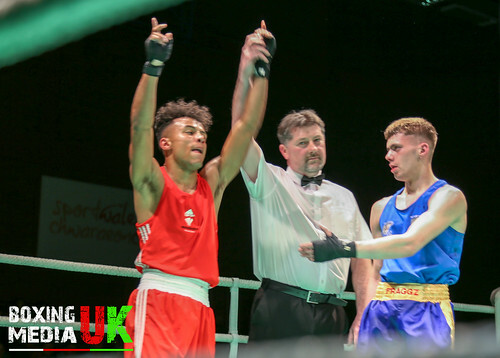 It was a battle of the punchers in the 81kg Light Heavyweight division with Ethan George(Penyrheol) locking horns with Michael Sinclair(Llanrumney). You never had the feeling that this contest would be tentative and so it proved , as both men got down to business straight away. It became quite apparent that George was carrying that extra bit of firepower and a right hand on the button badly hurt Sinclair. A fisted follow up deposited the Llanrumney fighter heavily onto the canvas. Sinclair gamely rose and beat Mr Collins count but continued to look in a great deal of trouble. Credit must go to Sinclairs team in the corner as they quickly brought their man round and sent him out for round two ,looking slightly more stable. Sinclair began to work behind his jab but George was still hurling tremendously hard shots and again a left right combination staggered Sinclair prompting another eight count from Mr Collins. Sinclair had to dig deep in the third to turn this contest round, and amazingly he managed to do exactly that. George’s bombs had caused him to become fatigued and Sincliar could now sense the contest was his for the taking. George looked out on his feet as Sinclair desperately looked for the finishing punch. Nothing was coming back from George and Mr Collins had to step in to issue a standing 8 count. The final bell sounded soon after and brought an end to a thrilling contest. All judges declared Sinclair as the winner who maybe edged the contest based on his big effort in the final round. Tremendous credit to both fighters. 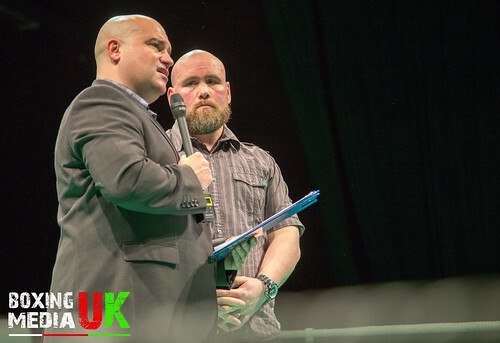 Up at Heavyweight Terrence Fairbank(Pontypridd) met Harley Vatsaloo (Penarth). As boxing fans know a punch thrown by a heavyweight can end a fight at any given time,so both men were sensible as they held their shape, worked behind the jab and neglected to take any unecessary risks. Vatsaloo appeared to be the more composed as he stalked menacingly looking to land punches over Fairbanks lead hand that he held low. The Pontypridd heavy significantly improved in the second round, relaxing a little more and landing straight shots and a right hook that brought cheers from his corner. Fairbanks seemed to be the better conditioned fighter as both mens workrate slowed in the final round. The fight ended with both spent and having to rely on the judges decision to declare a champion. Fairbanks in the red corner was declared the unanimous points winner in a closly contested encounter. 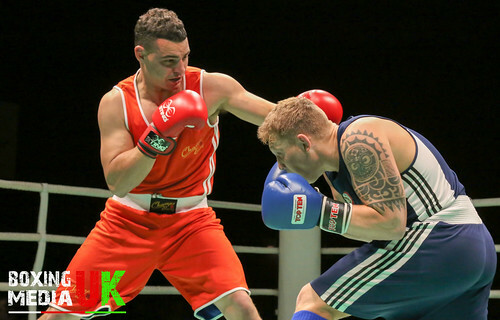 The final bout of the night would declare a winner in the 91kg+ super heavyweight category. 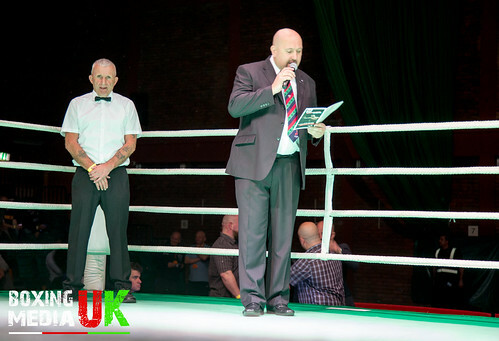 The two Participants were Richie Beynon (Bonymaen) and Phil Davis (prizefighter). Davis started the brighter, landing shots while Beynon perhaps waited a little too long. 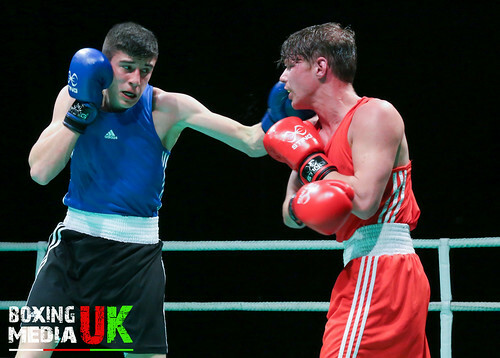 Beynon had shown he has plenty in reserve after coming through some very tough fights on his way to the final. Davis’s bright start continued into the second as he boxed smartly on the backfoot. Beynon was looking solid but not landing often enough, yet he was straight back into the contest after Referee Phil Parry gave a public warning against Davis. Beynon had collected a heavy nose bleed yet ignored the discomfort as he continued to walk forward hoping to land a significant blow on an opponent who was beginning to slow down. Beynon gave everything he had to stay in the fight as he shrugged off the blood and traded with Davis. Again we had seen another 50/50 contest with the judges perhaps giving credit to Davis’s early work as the Prizefigher man became the new Welsh Super Heavyweight Champion.